I will show you from scripture that Yeshua was conceived at the time of Hanukkah but first we need to look at the conception of his cousin, known as John the Baptist. John the Baptist conception dates Yeshua’s conception. Luke tells us that when the angel came to visit Mariam (Mary) Elizabeth was in her sixth month of pregnancy. So Yeshua will be six months younger than John. Luke also tells us what John’s father, Zacharias, was doing just before Elizabeth conceived John. He was serving in the temple as per the order of Abijah but we must look into the Tanach in the book of Chronicles to find out the times that Zacharias would be serving. 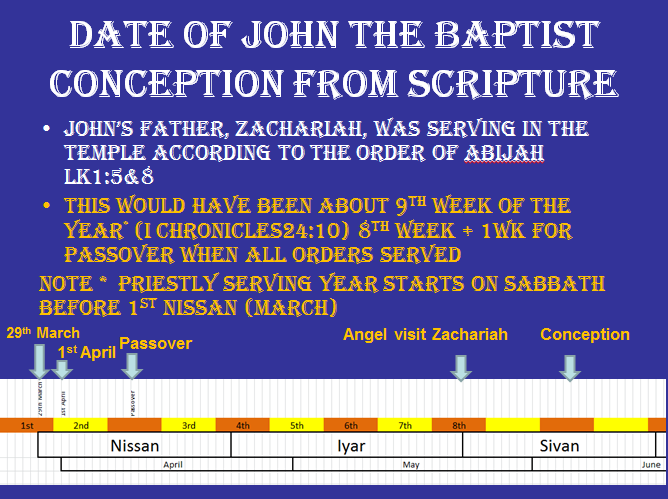 Chronicles (1Chr 24:10) tells us it was the eighth order, so starting at Shabbat before 1st Nissan each order serves for a week and everyone serves for Pesach (Passover) so Zachariah would have served the ninth week from the Shabbat before 1st Nissan. As he was serving an angel appeared to him and told him that Elizabeth would have a child in her old age. Through disbelief, Zachariah was struck dumb until the birth of John. This was a miracle the same as Isaac and Jacob and Esau. G_d had opened the womb of Elizabeth so she could have a baby in her old age. Babies were always looked on as a blessing. Luke also tells us that when Miriam came to visit Elizabeth that the baby jumped for joy at the presence of Mariam’s baby. Miriam stayed with her cousin Elizabeth until the birth of John and then she returned to Nazareth. John is conceived probably two weeks after going home after his service in the first week of the third month. If we add six months to this date we approximate the third week on the ninth month which is the time of the Festival of Hanukkah. Barbara De Gilio makes an amazing connection with Haggai 2:18-19. This date in the Haggai scripture is the 24th of the ninth month, (Kislev) – those who understand will recognise it as the eve of Hanukkah. There is a cryptic phrase “Is the seed yet in the barn” which along with Haggai’s reference to the foundation of the temple we can understand as the conception of Jesus. She then adds the value of the Hebrew word for pregnancy to it as days i.e. 271 days and finds that the birth would be 1st Tishri, 11th Sep 3BC. It is important to note that Sarah, Rebekah, Leah and Rachel all conceived with the help of the L-rd. These were different than Miriam’s situation, however, if the L-rd can make Sarah at 90 give birth, then it is no problem for Him to cause a virgin to conceive. Thus, all these women conceived through Divine intervention. Thank you for what I have just read you explained it so clearly.this is one reason I do not celebrate Christmas or Easter now this is my second year now .